Coming soon... A NEW series of itty bitty cross stitched sampler patterns, all to fit the Twisted Threads tin frames. The above sampler measures 2" x 2 1/4". 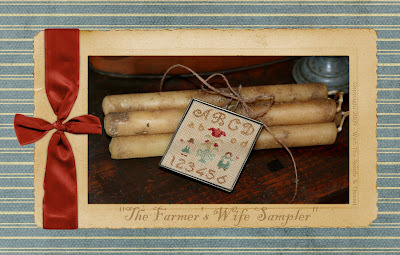 The sampler in the above photo is tied around a bundle of grubby candles...what a unique way to display your work! Keep an eye on our blog for other sampler designs & what other "things" we tie these samplers too! We will letcha know when this series of cross stitched designs is complete! Very cute Brenda... I love the idea of a little something for a friend too! Thanks for your creativity! I am punching ABC Fraktur now. Brenda, you have really to much of those beauties. I can't make them all. I have to do other first. Have been a big fan of yours for a while - looking forward to the smaller designs !!!! Cute, cute,cute! Can't wait for the patterns to come out! Another cute item. Look forward to seeing more. These look adorable - can't wait to seem how you use them.